I experimented and tinkered Sonic Pi music programming. I was able to explore and play to an extent. There are helpful tutorials that aided in my play. I noticed that I would play for a while. Then an idea would come to me and I wouldn’t know how to do it. I would look at the tutorials to get an idea of how to do it. I tried making a progression of notes. I also had the notes repeat a specified number of times. I might try to add more of these next time. Yes, a lot of trash or recovered materials. I don’t think one way is better than the other as we both are obviously quite satisfied of where our own preferred way of learning led us but I do have serious frustrations over the way I was forced to process a lot of “meaningless” content and explanations before getting my hands dirty, understanding and “feeling” why these things mattered for the subject so I would love to hear what you think about these differences. My impression is that most school classes are tough by people that were compatible with the “rational first” approach and found it perhaps more pleasurable to go through school. There is nothing wrong with that of course but it does seem to be hard for those who did fit into the system to empathize with learners that might have just as much potential but simply does not have the chance to go through a system that answers their needs in learning style. I am obviously comparing you to my wife and others in regards to this approach because of your comment on your preference of reading and familiarizing yourself up to a certain level of comfort before engaging with the activity. I hope this does not upset you. this is not intended as a negative comment or prejudge. A 2nd grader brought in a hydraulically powered armature she’d made. Comes flat, ready for assembly! Clapping Hands Making kit Size : A5(210 mm x 148mm) / Finished Product Size : 56m m x 48mm x 151mm(H). A Clapping Hands to make a color can be applied before or after. Made in KOREA. | eBay! I went to Home Depot yesterday for hardware. I’m excited to get started! I am not offended at all and am glad to have these conversations because it makes me rethink my approach and develop strategies for working with all the different brains in my classes. I really like Howard Gardners work on multiple intelligences, multiple modalities of learning and processing and I oscillate between teaching the way I was taught (a large part lecture and listen but also creative and inventive parents who learned through experience and multiple iterations) and the pedagogical development I am receiving. I teach Grade 3, 3/4, 4, 5, 5, 5/6, 6 and 6 classes in Science. 4 of those groups have an overlap for art. I have been trying to get my 5-6 students through a written skeleton for their science fair projects and it is not that successful as an approach: we need to tinker and explore to have a sense of direction. My battle is against over-stimulation and a class culture of consumption for pleasure/sensation. I need to get them engaged and slowed down so they are observing rather than consuming… and then put everything away… in an hour. And I don’t want the laptops open around our good old baking soda and vinegar explosions… So, maybe we need one table dedicated to laptops, where kids can access their google docs and the rest space in the class for hands-on study. I am not really answering your question in a profound manner. I am working through these dynamics (and probably will continue to throughout my career). Hands on is where I love to be teaching. We just created marble runs and afterwards I was introducing concepts like momentum, and friction although I did have some of those conversations with some of the students in context. Its the trickiest class I teach with a lot of drama getting in the way of learning so much of my time is spent redirecting kids who chase their marbles into other groups. Argh. I pursued the exploratorium link posted in a project and am now signed up for their Motion and Mechanics course and definitely identify with being a tinkerer. I model this for my students, both in projects I am working on for and with them: we are building iPad stands for green screen claymation and I am feeling like a real bum because I have not trusted them with creating their own design, after getting them to draw out and discuss their ideas. Rather, we are doing mine, which is having to go through different iterations so now is a great time to point out the ineffectiveness of my system, pull out a variety of materials and tools and let them problem solve it. I have not used it effectively in the sense I did not let kids immediately research their top 3 questions so our work lost its immediacy and became just another exercise. That said, their eyes light up when I explained that they were going to apply their top questions now. I apologize for my meandering response. I would say these learning style differences are met in Kindergarten where we have stations and rotations. My dad took that experiential model and applied it to his Integrated Science 11 class with highly successful results. I am tinkering through my iterations of balancing conceptual content (language) with physical experience. Many of my students are children of English second or third language parents and communication is an area that needs a lot of work. That said, I really think concept in context has a lot more impact. I also think school is like prison when I don’t engage my kids in learning that grows their skills and knowledge and when I don’t offer a variety of modalities, different kids cannot access what I am trying to share. Personally, I am a very kinaesthetic learner and sitting at a desk drives me bananas. I frequently have my little kids chanting and doing actions when we are learning new words. I do with with some of my older classes too. Motor memory is my pal. Your questions are really good ones. I am sorry my answers are so messy (and long). How do I get kids to activate prior knowledge in a variety of modes? although this week is about “Play” I personally relate it quite strongly to “Project”. As I said I am a system designer. I conceptualize playful experiences such as video games and gamified apps. I have been doing this for about a decade and one key principle I found out is that having a “Meaningful” project that the learner/player felt ownership over helped quite a lot in engaging and keeping them interested and coming back. again thanks a lot for sharing your ideas and experiences! love playing with Makey makey and Scratch and try to create a music band was my goal! Thank you. That is great, I want to introduce these to my students grades 3-5 I have about 300 students in those grades. Here is the link of my scratch activity - Paper helicopter. I said before I am a LEGO Serious Play Facilitator and I would like to talk about an experience in one workshop I did. I put an instruction to a group "make a model with legos about a change in their lives"
A person built a kind of tree and she said that the change needs strong roots like knowledge and have in the mind where are you going to go or what is the change’s goal; the trunk is the path of the change and the leaves are the reward of change. But the trunk has some white space or holes; when I asked about that she said those are things that she needs to make the change; the interesting point was she unconsciously built those holes and when I asked about those she knew that she lacked things for the change. Evagelia congratulations for your work!! this time I actually have no suitable experience on tinkering as far as I get the meaning of the word. But we did some playful projects at my school working with different materials and working out presents for our christmas market next week. Children were working with wood, paper, natural materials, polymer clay, etc. All of them were having fun while exploring the material, how it reacts when you do something with it and what to do when something goes wrong. So, actually, they were tinkering, right? Here are some photos to get the general idea. Froso, thank you for your feedback. Based on your name I assume your are Greek, thus, all the above don’t seem strange to you! If you work in a Greek elementary or high school you are very well aware of the curriculum restrictions. This year I offer an after-school program on C++ and algorithmic problem solving and this is where I see LCL ideas such as hard fun, passion and tinkering come to life. Nice talking to you! We may get the chance to collaborate in the future. Perhaps in an eTwinning project and apply the LCL ideas! Some of my recent tinkering is work related and trying to make home-school communication a lot more efficient and accessible. As a school board, we have a designated platform for publishing our blogs (online agendas) that really lack in personalization or interest, as they are really “minimalist”. With the desire to share pictures, files, videos, etc. with families at homes, I started playing around with Blogger. Nothing new to a lot of people, but I’m not really a technology person, so it was really new learning for me. Just developing the format itself took time to see which were aesthetic and provided the layout I wanted. Then, I got to fine tune the process, thinking about all the different gadgets I could add to make the blog work for me, and my students’s families. It’s a continued work in process as I receive feedback from my “audience”, and as I figure out all the idiosyncrasies. I’m also very particular, so when font’s don’t match, or the layout doesn’t work, or the images don’t centre, I’m constantly tinkering and improving. that detailed the whole process. Basically, teacher introduces the 4 rules, 1. write as many questions as you can. 2. Don’t stop: to judge, to answer, or to discuss the questions 3. scribe questions exactly as they are said, 4. change comments into statements. Students take a few minutes to discuss which rules they think will give them difficulty. This was a huge insight for me: a large number of my very silent students get stuck on judgement: both judging themselves and fear others will judge them as inadequate. After this reflection on learning, students get a Q-focus (question focus) developed by the teacher. Then they have at it, numbering their questions as they go. The teacher has to work very hard not to suggest any questions. If the well is really dry, prompts can be posted (the 5 w’s and how). I set the timer for 7 minutes, they wanted more. When done, teacher gives a mini-lesson on open and closed questions. Students classify questions as such. I made the mistake of saying a closed question was a yes or no answer, but it can also be one or two words… Open needs more explanation. Finally, students come to a consensus on their 3 most important questions. I love this because we work so hard as teachers to find the right question… and steal that skill development from our students. 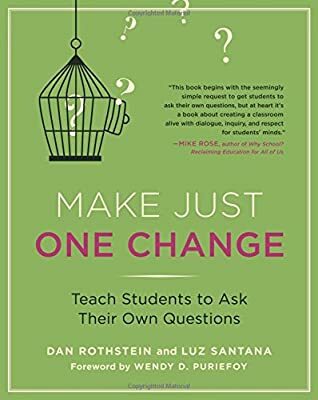 As learners, being able to work toward posing the right question is powerful. I really want to foster independence in my students: I want them to be life long learners able to pursue their passions. I saw students who barely said a word all year and are frighteningly below level in literacy skills create questions that sought fundamental understanding. I saw students realize what they didn’t know and get a more profound sense of what they need to learn about to understand their science fair projects. I saw a very lazy kid come up with key concepts he needs to research to build an understanding of density. I love project learning. I struggle with accountability, and as a teacher the think time, and the tinker time. I also struggle with kids chasing projects because they think it will be impressive and raise their social status rather than pursuing their own interests. There is also the dynamic of working in pairs and needing to come to a consensus… Maybe I need them to form groups around shared interests… it might be interesting to do things anonymously… although that strategy would work once as I suspect they’d be planning in advance to line up partners. @Tomas_Gerardo_Ibarra, that sounds like art from the heart. That is a beautiful topic for building. My principal has asked me last year to have our students create murals on old benches that we received as a donation. I found my theme just this year: support. What does support, be it physical, emotional or social look like? I am excited to see how we can organize images either as narrative like a comic strip, or through juxtaposition so the parts speak as a whole. I would love to shine a light on support as a fundamentally positive quality of a community and want to ‘post’ examples to prompt us to be supportive. @kathleen_f love the dove! and the pipe cleaner wires! trying to set up LED’s for our homemade trains and that is a great solution. Construction paper crayons (croyola) would work nicely for adding detail: texturing feathers, wing shape, eye… LED as eye? drawn on beak? What about using 2 pair of pliers and 2 partners to unwind part of pipe cleaner to remove the fuzz then rewind?